The Radio Edit evokes an army of galloping horses with its formidable beat. As the ground shakes, the bassline rumbles and quakes under the weight of sonic Spartans set off to do battle. The minor-key of this track suspends tension in the air as the mood conjures visions of riding out into the dark night. Imagine mysterious, ebony-colored horses, their manes of fury ablaze against a black night sky. Like wild forest-fires of the mind, the horns are insistent and commanding. The energy builds as Rayel drives the beat forward. “Dark Resistance” is a triumph of will and a victory for music-lovers throughout the galaxy. The Original Mix adds militant drums to the intro, but it’s the propulsive rhythm that lends the track its weight. 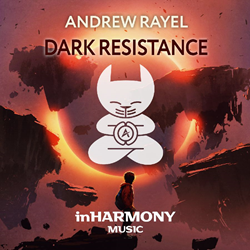 With “Dark Resistance,” Andrew Rayel seems to be telling listeners, “Get up! Let’s go! It’s time to move out!” It becomes physically impossible to lay back and relax if this track is being played, such is its careening momentum. Hailed by Armin van Buuren as “the future of trance music,” Andrew Rayel (real name: Andrei Rata) is a classically trained electronic dance music DJ and producer from Moldova often referred to as the “modern-day Mozart.” As a DJ, Rayel exudes an unbridled enthusiasm for the music he plays and his onstage performances are electric and filled with physical energy. Drenched in a well-earned sweat after every set, Rayel earns his position as a bandleader, stirring up his crowds’ passion as much with his music selection as with his bodily vigor. He has DJ’d the world’s biggest festivals, including: Ultra Music Festival in Miami, TomorrowLand in Belgium and TomorrowWorld in Atlanta, Stereosonic in Australia, Global Gathering in the UK and other countries, Electric Daisy Carnival in Las Vegas, Electric Zoo in New York, Transmission Festival in various countries, Ministry of Sound in the UK, Dreamstate in San Bernardino, Electronic Family in Amsterdam, Zoukout in Singapore and Together Festival in Thailand. Rayel is a regular on the lineup at various ASOT stages around the world. Nightclub residencies have him performing onstage at super-clubs, including: Marquee Nightclub & Dayclub in Las Vegas, Marquee and LAVO in New York, Ushuaïa Beach Club in Ibiza, Zouk in Singapore and Kuala Lumpur, Escape in Amsterdam and Ministry of Sound in London. For information on Andrew Rayel, Paul Damixie, Fatum, MaRLo, Maro Music (Marek Walaszek), NativeOrigin303, NKRIOT, Zander (Traveler), Alex Ariete, Brussels Airlines (proud partner of Tomorrowland), FINLAY, Ben Rauch, and artists like Armin van Buuren, contact EMILY TAN Media Relations (U.S.), +1(917) 318-3758, EmilyEmilyTan@aol.com. Follow EMILY TAN Media Relations on Twitter @EmilyEmilyTan and LinkedIn http://www.linkedin.com/pub/emily-tan/4/342/70b.